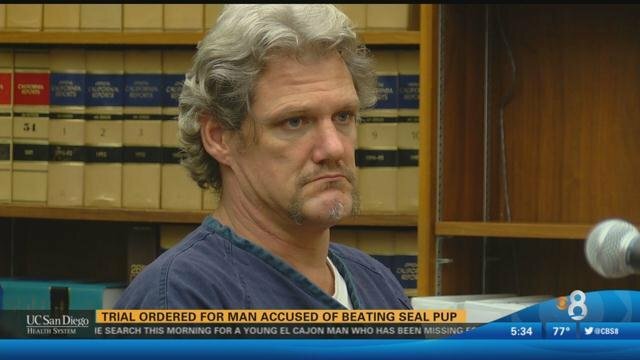 A homeless man (aka the San Diego Seal Killer) who claimed he bludgeoned an elephant seal pup to death because he thought the animal was in distress was ordered Tuesday to stand trial on a felony charge of cruelty to an endangered or protected animal. Roy Lee Miller, 45, faces up to five years in state prison if convicted. Witness Mark Valentine testified that he and Miller were drinking vodka near Spanish Landing last Feb. 27 when they heard the Northern elephant seal making “ungodly” sounds, worse than a baby screaming. Valentine said he walked away and later told authorities that Miller might have hit the seal with a rock. The witness said Miller cried the next day when he talked about what happened. Kerri Danil, a research biologist for the National Oceanic and Atmospheric Administration, said the seal pup — thought to be about a month old — had multiple skull fractures. A marine mammal veterinarian testified that the seal pup — not normally found in San Diego Bay — was fine and making normal seal “calls” when she observed the animal on Feb. 27. The veterinarian said a lay person could think that a seal was in distress if they heard the “unique” pup calls. Harbor police Detective Robert Twardy testified that Miller approached him after the detective found the seal’s body on the beach. “He said he was responsible for putting the seal out of its misery,” Twardy testified. When asked why he didn’t call 911 when he came upon the seal, Miller said he didn’t know and was “distraught,” Twardy testified. But Deputy Public Defender Jo E. Super disagreed, saying there was no malice.